Piston rings serve three basic functions in an automotive engine, gas sealing, heat transfer, and oil control. The primary duty of the top compression ring is to provide a seal that prevents combustion gas or pressure from bypassing the piston. This is achieved by maintaining contact with the cylinder wall at all times. The second compression ring also assists the top ring in its sealing function, although its main purpose is to provide a secondary form of oil control for oil that has bypassed the oil ring (fig. 1). 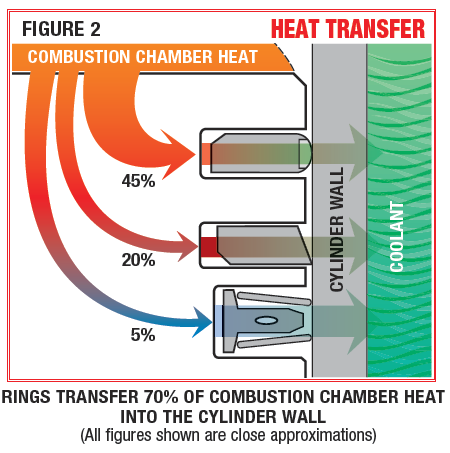 Secondly, both compression rings and the oil control ring transfer the heat of combustion from the piston to the cylinder wall where it is then transferred to the cooling system (fig. 2). Lastly, the second compression and oil ring also serve as an oil control system regulating the film of oil on the cylinder wall. 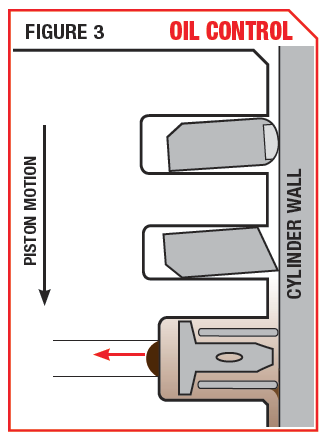 As the piston moves downward, the sharp edges of the second ring and the two rails scrape the top layer of oil off the cylinder wall, leaving only a very thin layer behind. The excess oil is discharged by three methods. Most simply gets scraped by the lower oil ring rail back down into the oil pan. Some excess gets forced into “drain back” holes in the oil ring groove, to the interior of the piston and then back to the oil pan. If the piston has “pressurized pin oilers”, the remainder gets forced into holes in the oil ring groove through the pin bosses into the wrist pin reservoir, then directly onto the wrist pin. Axial Height: The width (thickness) of the ring in the axial direction. End Gap: The end gap clearance when the ring is compressed to the bore diameter. Gas Nitrided: A process used to harden the perimeter of a ring where nitrogen atoms penetrate the base material and form an extremely hard outer layer that provides excellent wear and scuff resistance. A. Neutral Barrel: A term used to describe a piston ring that has no torsional bias or twist. B. Positive Twist: An asymmetric change in the ring cross section that causes it to twist in an upward direction (toward the piston crown) aiding ring sealing of the top and bottom of the ring groove. Positive twist is used only on top compression rings. C. Reverse Twist: An asymmetric change in the ring cross section causing the ring to twist downward (toward the piston skirt) that enhances the second compression ring’s oil scrapping properties. Radial Width: The width of the ring in the radial direction. Ring Axial Sides: The top and bottom surfaces of the ring. 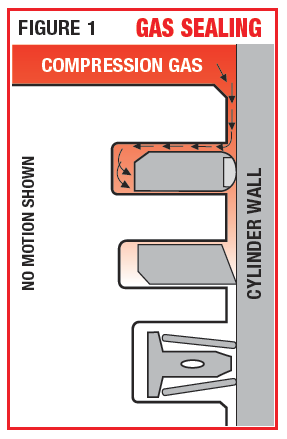 The section that contacts the cylinder wall. Torsional Twist: The installed position of the ring due to a chamfered area on either ring side that helps the ring cross-seal.